I recently read this excellent blog post on PandoDaily by a venture capitalist, Scott Johnson. I was impressed by the simple explanation of four past and present hot investment categories. It’s often difficult to grasp all of the different types of venture investments in consumer tech companies and many times I feel overwhelmed by the large investment numbers rather than the startup itself. Johnson makes the point that the niche app category (a la Instagram) was making waves in the past couple years, but it has hit its high watermark. 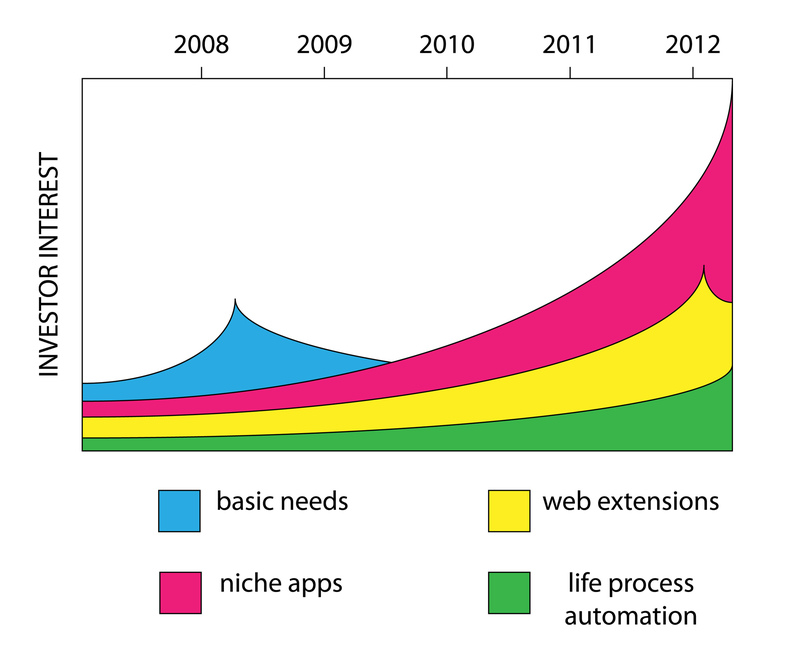 The dominant category in the next couple years will be life process automation. Life process automation has just recently taken off because location-aware mobile devices are enabling immediate services that were simply not possible five or ten years ago. Uber is a great example, the mobile interface forces simplicity and thus users are left with a simple solution to the need for a taxi: tap a button and wait a few minutes watching the car to come to you. Johnson also makes the point that many life automation apps were built during the pioneering days of the web. Priceline eliminated the need for a last minute travel agent, and eBay brought your home garage sale to the world. But even these existing sites are prone to disruption. eHarmony is an easy example; Grouper sets up drinks between three guys and three girls. Just connect with Facebook and wait for your date. Craigslist put newspaper classifieds online. Airbnb brings previously bare bones craigslist listings to life with property rentals. They’re taking it one step further by automating the process of renting out a spare room and making it beautiful. Netflix recommends movies for you to watch instantly. It’s absolutely fantastic and these are real businesses with massive revenue. Going forward the most popular companies in the next couple of years will mechanize some repetitive aspect of life. Keep an eye out for companies that are making moves in life process automation, they will likely appear in places that can be improved with the help of mobile technology. ← So What Do You Do At Your Startup? Wow, this is exciting. It reminds me of the commercials where the guy will send you razors so you don’t have to buy them at the store. Life automation….Before long, lets have a job automation so I can sit at home and make money! This blog explained about the life process automation in very detail with the neat diagram.